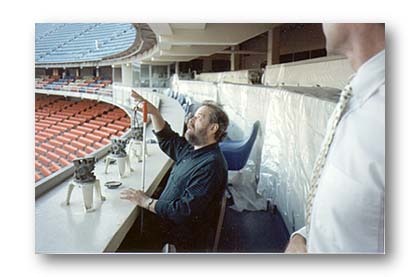 In October, 1989, Bob was given a private tour of Dodger Stadium. He is seen here in the press box sitting where the legendary announcer Vince Scully sat while doing the play-by-play of the Dodger games. During this tour, Bob ran into the legendary Dodger manager, Tommy Lasorta and had a nice conversation with him while Tommy was on the treadmill in the Dodger exercise room. 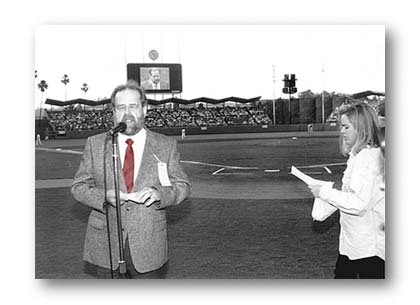 On July 27, 1991, during the Dodger promotion "Think Blue Week", Bob was the Dodger Fantasy Public Address Announcer. Here he is, from a spot near home plate, announcing the starting line-up of the game between the Los Angeles Dodgers and the Montreal Expos. In the background you can see him on Diamond Vision reading the line-up using Braille notes. On Bob's left is his daughter Beth who accompanied him onto the field. 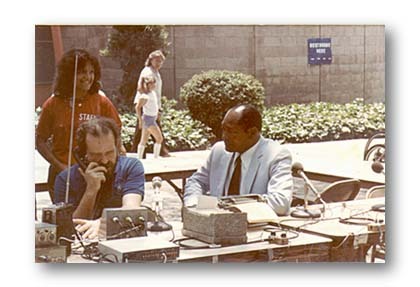 Bob interviewing Los Angeles Mayor Tom Bradley, during a remote broadcast of his weekly Jazz radio show, "Bob Ringwald's Bourbon Street Parade" on KCSN 88.5 FM Los Angeles, 1984. Bob and daughter Molly sitting at the piano while filming "Twice Upon a Time". 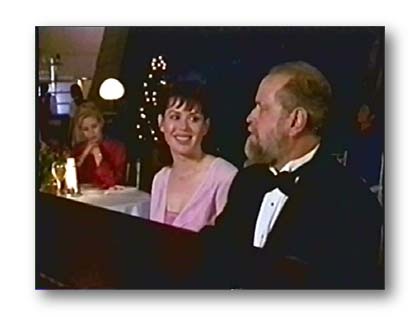 On June 24, 1998 Bob filmed a scene with his daughter Molly Ringwald in the Lifetime Channel's Movie Of The Week, "Twice Upon A Time". 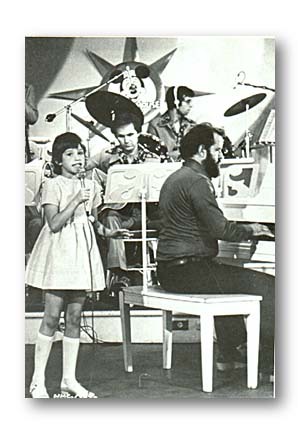 Bob plays a nightclub pianist, accompanying Molly as she sings "The Second Time Around"
This was taken at Capone's Chicago Tea Room and Pizza Joint in Sacramento, California circa 1971. 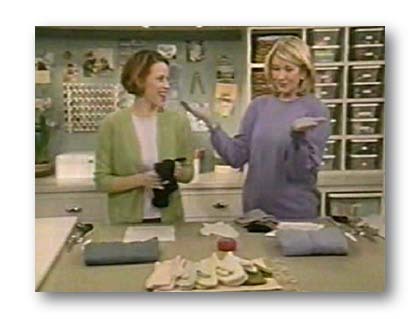 Daughter Molly Ringwald with Martha Stewart, Martha Stewart Show TV, Feb 20, 2001. Molly Ringwald was "Pretty in Pink" in the movies, wore a "Green, Green Dress" in Jonathan Larson's Off-Broadway musical, tick, tick...BOOM! and hopes to be "Perfectly Marvelous" in black beginning Dec. 18, when she stars as Sally Bowles in Roundabout Theatre Company's Cabaret on Broadway. She'll re-team with her tick, tick co-star, Raul Esparza, who plays the Emcee in the celebrated revised revival of the groundbreaking 1966 musical based on Christopher Isherwood's work and John van Druten's I Am a Camera. 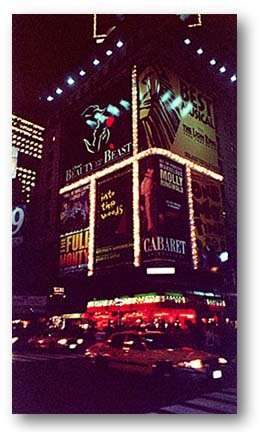 Directed by Sam Mendes with Rob Marshall, with music by John Kander, lyrics by Fred Ebb and book by Joe Masteroff, Cabaret continues at Studio 54, 254 W. 54th Street between Broadway and Eighth Avenue. Ringwald played Susan in the rock musical, tick, tick...BOOM!, earlier this year at the Jane Street Theatre. She is fondly remembered for a number of films she made as a teen actress, including "Pretty in Pink," "Sixteen Candles" and "The Breakfast Club." Her stage credits include How I Learned to Drive (New York and Los Angeles) and Horton Foote's Lily Dale, which earned her a Theatre World Award. Her film credits include "Tempest" with John Cassavetes and Gena Rowlands, "The Pick-Up Artist," "Fresh Horses," Jean-Luc Godard's "King Lear," "Betsy's Wedding" and more. Larry Keith is Herr Schultz, Carole Shelley is Fraulein Schneider, Matthew Greer is Clifford Bradshaw, Candy Buckley is Fraulein Kost and Peter Benson is Ernst Ludwig. 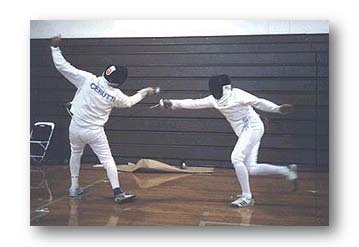 Front row L-R: Ron Deeter, Ralph Thompson, Gary Church. Back row L-R: Bob Ringwald, Bill Gunter, Art Terry, Jim Maihack. 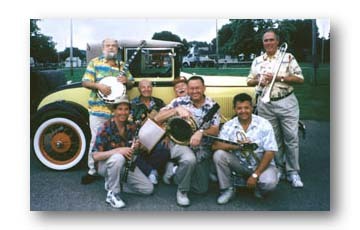 Second Annual International Washboard Festival, Logan, Ohio June 14 - 16, 2002. The 1929 Model A Ford Cabriolet is owned by Joel and Barbara Ringwald Weaver (Bob's fifth cousin) of Westerville, Ohio. the 29th annual Caribbean JazzSea cruise, 2012. Jan 6, Day 5, on the high seas out of St. Kitts, bound for St. Vincent. 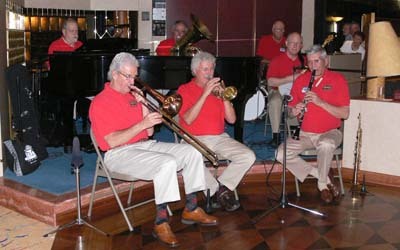 Front L-R: Doug Finke, trombone; Bob Schulz, cornet: John Goodrich, clarinet, soprano sax. 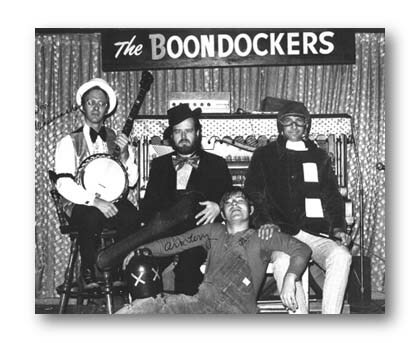 Rear L-R: Bob Ringwald, piano; Jim Maihack, tuba; Larry Kostka , drums; Scott Anthony, banjo. Bob met Louis Armstrong twice. 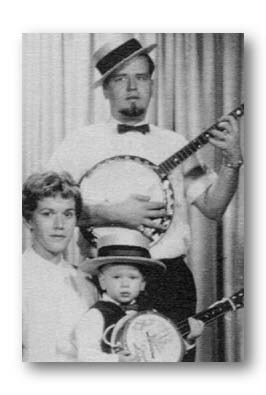 First time was in 1958 at a concert at Governor's Hall in Sacramento. 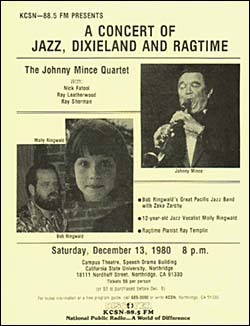 The 2nd time was at the Monterey Dixieland Festival in 1968. 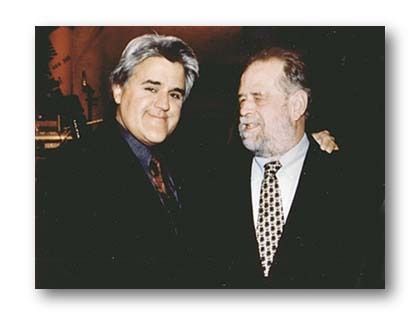 Unfortunately he never thought to get a photo with the legendary musician. On April 5, 2016 he finally got the photo that he always wished he had. 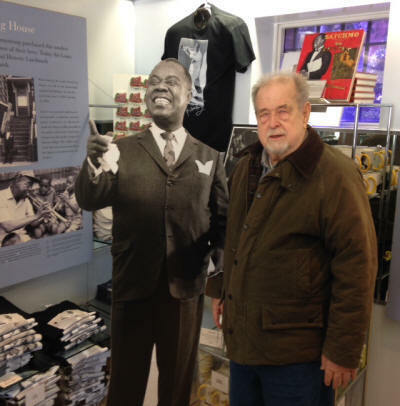 This is taken at the Louis Armstrong House Museum, 34-56 107th Street, Corona, NY 11368, 718-478-8274.
visit to the Louis Armstrong House/Museum in Corona, Queens, NY.